This volume brings together for the first time a collection of essays, based on original research, which focus on the history of nutrition science in Britain. Each chapter considers a different episode in the development and application of nutritional knowledge during the twentieth century. The topics covered include: the chewing cult of Horace Fletcher, dietetic education, the popularization of milk, the Dunn Nutritional Laboratory, and wartime involvement in policy making. 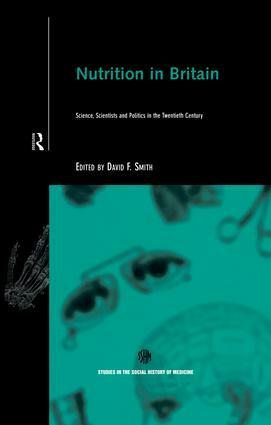 The selection of essays in Nutrition in Britain provide valuable new insights into the social processes involved in the production and application of scientific knowledge of nutrition. This book will be fascinating reading to historians of science or medicine, as well as to medical sociologists, nutritionists, home economists, health educators, food activists and anyone with a professional or general interest in food and nutrition. 'For anyone interested in the history of nutrition, whether from the standpoint of its scientific investigation or from a policy or manufacturing angle, Nutrition in Britain provides challenging and insightful accounts which also provide much food for thought about the overall history of British society in the twentieth century.' - Lara Marks, Imperial College, London.